Thanks to El Capitan a special birthday gift brought an awaited addition to my ever dwindling supply of scotch whisky in my stores. Knowing in advance the possibility that a whisky was in the woods, plus experiencing Capitan's love affair with his other mistress Ardbeg, it was not unexpected that Peat had to come into it somewhere. 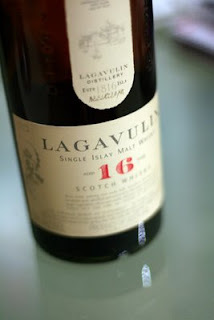 I was introduced to the Lagavulin 16yo and yes she had legs and good side of booty. On opening the bottle, with El Capitan and the Secretary huddled close and expectant, the expression would be 'she smelt smoky and heavy.' Dark in colour on the pour she sits behind the glass like a lady of the night in an Amsterdam red light district, looking straight through you, disinterested, but your intrigued, she does not give a damn because she knows you have been weighed and found wanting...it's only a matter of time. Initial tasting is dry, wait no...DRY. After saturation she becomes slightly more fragrant but ultimately dry, smoky and dare I say it assertively ashy. Aptly put by the Secretary, 'a bush fire' referring to the taste one gets in the mouth and nose when in proximity to burning scrub. Think driving down the highway seeing a white haze of bush fire, you close the vents, no wait the smell is in the car, the smell is in the nose, the taste is in the throat and it's not leaving soon. The intensity of the flavour truly saturates and gets into the gums and tongue. Not as heavy as the Ardbeg still a lesser man would cut it with water like a cheap street smack dealer blending in the backing soda, but I say hold out as the flavour will easily sit in the mouth an hour after even a half dram. I must say without cutting (and I am not the cutting kind), it is a short drink to be experienced on occasion rather than a daily. Better drunk on a rainy cold evening.